We have a variety of acrylic display cases available for exhibitions, trade show and product launch events. 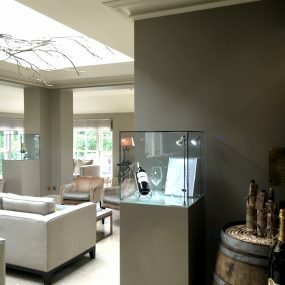 As our acrylic display cases are bespoke made-to-order, the sizes available are determined by the customer requirements. Acrylic Display cases with doors, are lockable and can be individually keyed if you require this additional security. You are able to secure items in the cases which need to be protected (for example Jewellery) and remove it when a customer wishes to try the item. Should you need a 5 sided case to leave an item stationary for longer periods of time, the acrylic case can be secured to the plinth directly. Acrylic is lightweight particularly in comparison to glass. If you wish to move the exhibition display cases from one location to another, then acrylic is the best material of choice. When looking for the best in optical clarity to display your products, acrylic is the choice, you may have noticed that green hue you get with glass? well that doesn’t happen when you use acrylic, its perfectly clear! 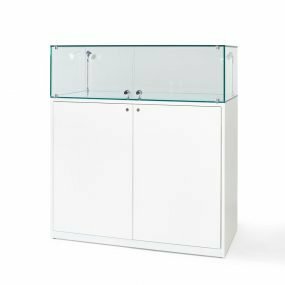 If you need the plinth to be rebated so that the acrylic case can be secured in place then please ask when requesting your quotation, we can manufacture the plinth and acrylic case so the security holes line up on the sides to restrict access to the contents. As the acrylic is UV bonded or solvent welded, the edges are incredibly strong. If you have a particularly heavy item we recommend you inform us so that the plinth can be reinforced to take the weight safely. We are able to make the cases to best suit your needs in terms of size, shape and the customisation required on the plinths. 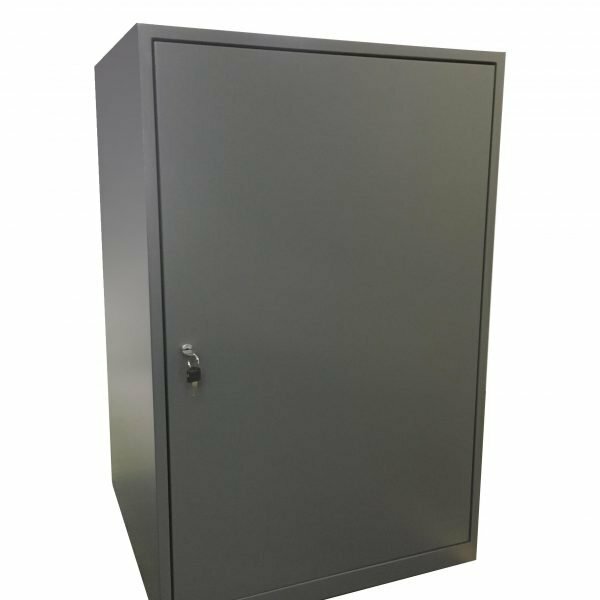 You may prefer to have lockable doors on the plinth so that you can store items inside the plinth. Puma Shoes used acrylic display cases, with LED lighting through opal acrylic in their base and a black light block vinyl graphic for their logo to shine through. This was a bespoke design sent to us by Puma Shoes who inform customers of the launch date of their new shoe designs in a darkened environment. The acrylic display cases were 5 sided and placed over a plinth with a rebated top. The acrylic was clear 8mm acrylic, UV bonded at the edges. The size of the case was 50cm square, and 30cm high to display the shoes. SWATCH used a Crack The Code Acrylic Case at their Shopping Centre Exhibition. Customers had to guess the code to try to open the box to win a watch. The idea was then used by Amazon at a Retail Exhibition where they placed Kindles inside for customers to win. They had 5 cases on the same stand all programmed with different codes. If you would like to run competitions on your exhibition stand a Crack The Code Case is a brilliant product to use. Should you need any ideas to help you with a Crack The Code Display, Ellie has organised the previous ones and will be more than happy to help you. Dudebox have a variety of different sizes exhibition plinths and 5 sided acrylic display cases which were bespoke made for the dudebox launch in Central London and New York to display their model toys and their boxes. The cases started at 30cm square and ranged up to 30cm x 60cm for some of the larger models needing to go on display. Take a look at the Dudebox London launch event and you will spot our plinths and 5 sided acrylic display cases. This is one of the main questions we are asked when customers order acrylic display cases. Basically a 5 sided acrylic display case is a cube without a base, they can also be know as acrylic display hoods. Held in place over the plinth with a rebate that is cut into the top of the plinth. This type of acrylic display case has no door, to remove the contents you have to lift off the acrylic case. Great for display items that you don’t need to access in front of customers. Six sided acrylic display cases are cubes that include a base and door to access the product being displayed. These we also recommend sit onto a rebated plinth so that the case can locate easily and hold in place on top of the plinth. If you’re interested in buying or hiring any of these products, contact us now on 01934 708 717. We also have an online chat system for you to talk to us directly for more information on our products! If you would like to send us any images of what it is you have in mind, your logos to be attached or a project brief, please upload to your enquiry form here.